Everything is content. Especially in a post-panda world. Content is on our minds, invading our subconscious and eating the world. Content is king and queen. Heck, it’s the entire court. All this talk of content, but do we have the slightest idea how to measure the content we are creating? Once again, Google Analytics comes to the rescue! In 2014 I had the pleasure of speaking at a conference that was outside of my normal comfort zone. It was a conference dedicated to website content, content management and content strategy. Quite different from the normal PPC/SEO/Analytics circuit. While it ultimately has to do with making great websites that people want to visit, I was due for a fresh perspective. That perspective came from the Now What Conference, a top 2 favorite conference experience for me in 2014. That’s saying a lot, because the other 20+ conferences that had me speak were fantastic as well. It was my first time talking about Google Analytics specifically for content professionals. 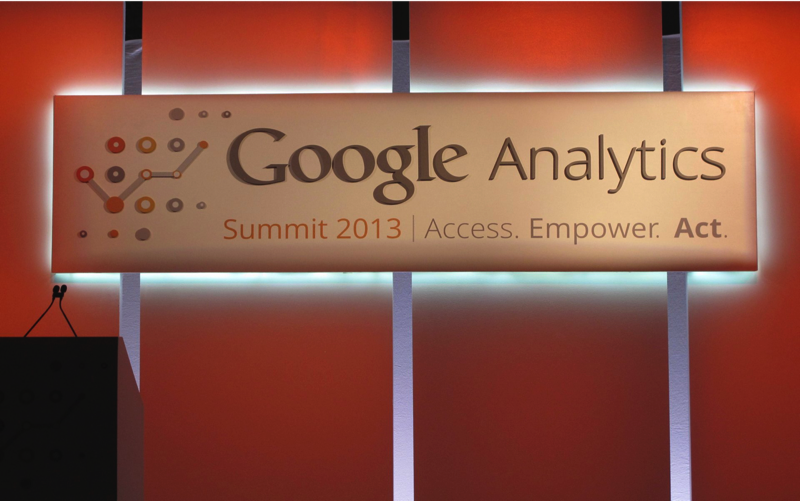 The presentation gave 10 quick hitting Google Analytics tips for measuring content marketing. You can watch it below (35 minute video). 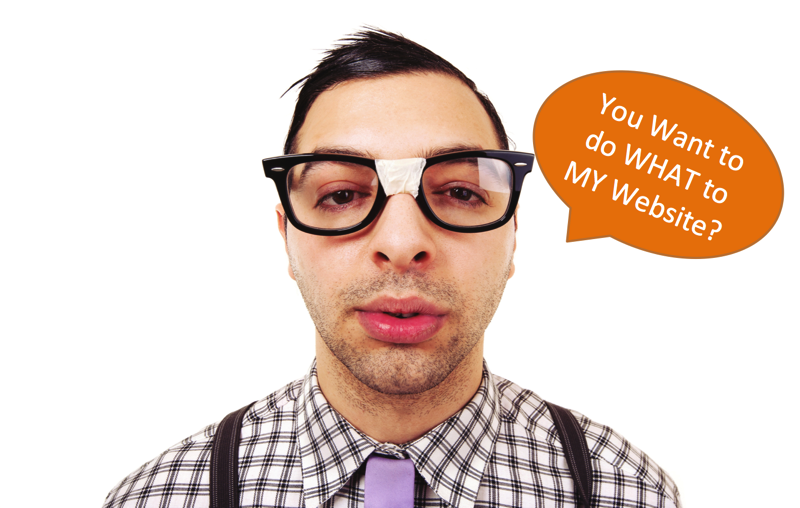 Jeff Sauer – “Using Google Analytics to Improve Your Website” from Now What? Conference. If you prefer to view slides, you can also check out the deck embedded on Slideshare. For those of us who like to read, the rest of this post will outline 10 ways that we can align our content strategy with Google Analytics. Read along for resources, techniques and insights about how to measure your content in Google Analytics. We are now entering the third decade of web analytics. For the first decade, IT departments and webmasters owned analytics. They called everything “stats” and used hits as a measure of success. Website marketers were completely in the dark with how their sites were performing. It’s no wonder why so many companies fizzled out during the days of web 1.0. It was truly the dark ages of measuring online success. Maybe analytics could be a useful way to measure our site? While implementation was usually still in the hands of IT departments, marketers started to get a seat at the table. Analytics enabled sustainable business growth, and online business boomed. Many marketers came into the industry during this growth period. Many marketers take the ubiquity of web analytics for granted. As we enter the third decade of web analytics, another shift is happening. The ability to write code and setup servers is no longer required for tracking websites. Sure, being technical definitely helps, but much of our tracking needs do not require code. With these two technologies enabled, insights are put in the hands of marketers. We are in a measurement revolution, and Google Tag Manager is the technology that got us there. 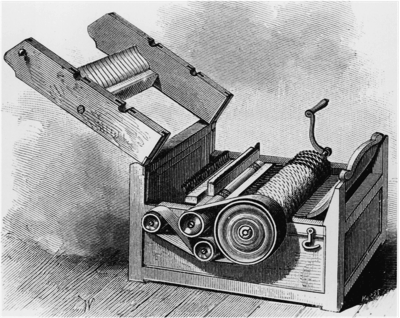 Think of it as a modern day cotton gin. Advances in technology have enabled us to measure more than ever. Yet if keeping up with analytics trends is not in your job description, you may not be aware of all the advancements. This is especially true for those who have been using Google Analytics for years. 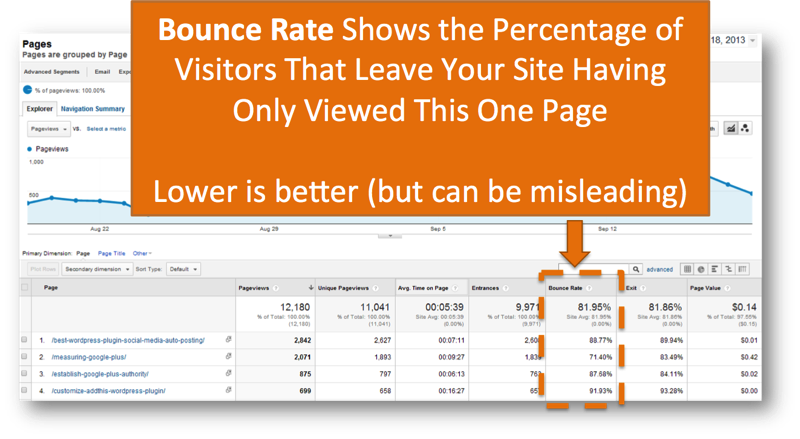 You may look at a report showing your traffic and check page views, but not go beyond one or two reports. To encourage content marketers to go beyond a few reports, I created a piece of content marketing. The result is the Periodic table of Google Analytics. This table, first released in 2013, will be updated in 2016 to include nearly twice as many elements. With easier access to data, we can focus on making improvements! Of course, you can use Google Analytics to measure the impact of your own content efforts as well. 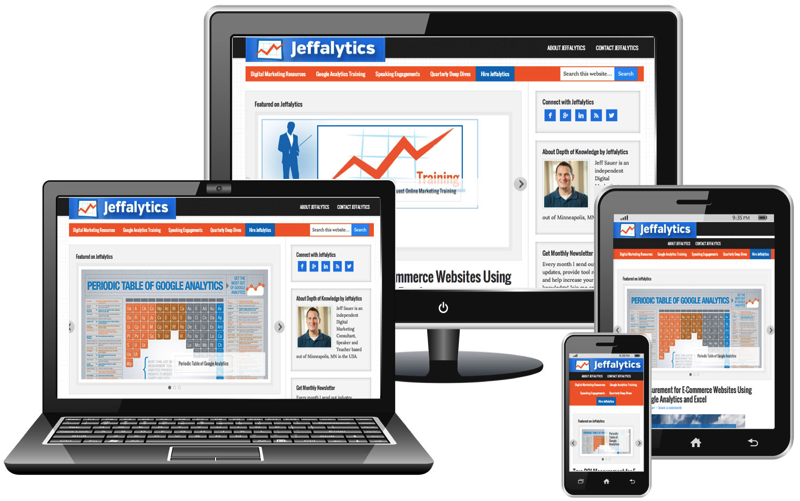 If you are interested in mastering this powerful, yet free Google tool, read more about Jeffalytics course where we take you to Google Analytics certification in less then 6 weeks. Now that we have easier access to data, our voice as marketers will be heard, right? Not exactly. Data alone is not a narrative, strategy or insight. Data is just the facts about what happened. We need to use our minds to turn data into information that others can consume. 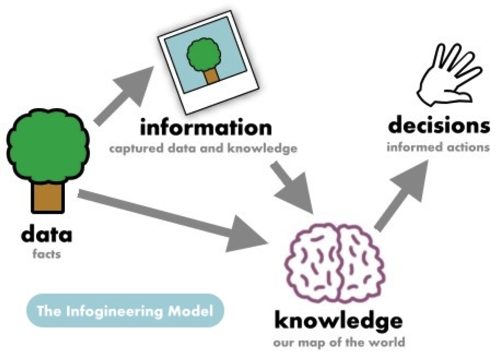 We use data and information to form knowledge. We need to use data to tell a story about what happened with our visitors. As content producers, we should understand that it is the story that hooks our audience. The same goes for our own story. Use the data you collect to tell a story. For example, you are receiving a lot of organic search traffic for your articles. But they leave after seeing just one page. Put together a story about why that is happening, and then come up with an improvement plan. 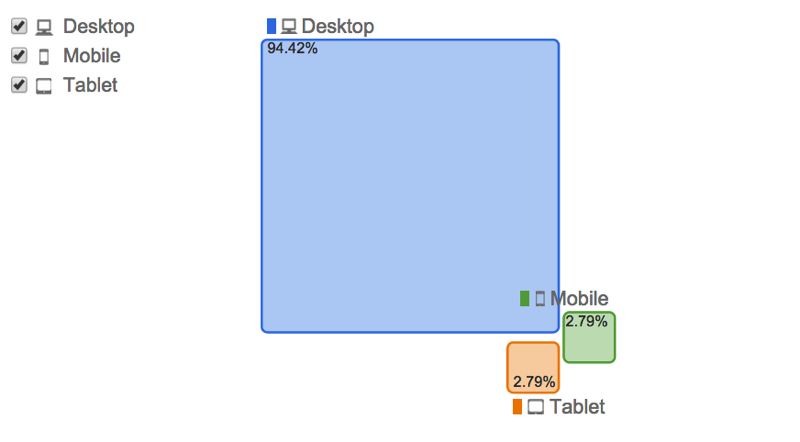 Traditional web analytics measures each device visiting our website. Each machine that visits our website gets a unique cookie that allows us to track whether we have seen them before. While this worked for years when most visitors only had one device, that is simply no longer the reality we face as marketers. Our prospects may visit us on many devices before making a purchase decision. Our customers may access their accounts on many devices as well. For example, I have logged into my Moz account from different devices, countries and timezones. The proliferation of devices created a tracking nightmare for website owners. Fortunately, the Universal version of Google Analytics allows us to assign a unique user ID for our known visitors. This gives us the opportunity to look at a single visitor as one continuous prospect. When user ID is configured, you can start to see how logged in visitors are accessing your site. To this point you may have found some of these points to be a little more technical than your normal comfort zone. Just remember that it is important to know that these features exist and are available. You don’t have to be technical to take advantage of these features. But you may need to find a technical ally to help with some implementation. 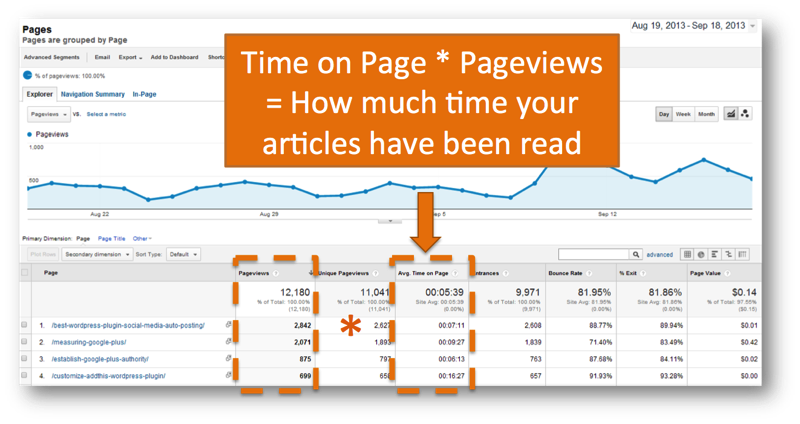 Now let’s get to the fun part, the reports that we can unlock in Google Analytics to measure our content efforts. The first thing I recommend is that you set goals in your Google Analytics account to track your success. You do this by setting goals in GA. Many of you may already have goals set up. If not, here are some guidelines to follow. Make a list of the actions that generate money for your site (sales, leads, phone calls, ad views, etc.). 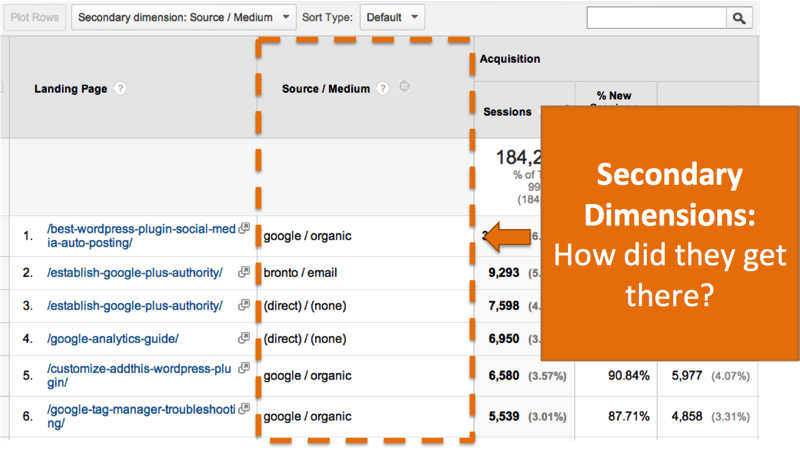 Take this list and configure these actions as goals in Google Analytics. We call the goals that make you money Macro goals. You may not get more than 1-2% of your visitors to take these actions, but they fuel your results. 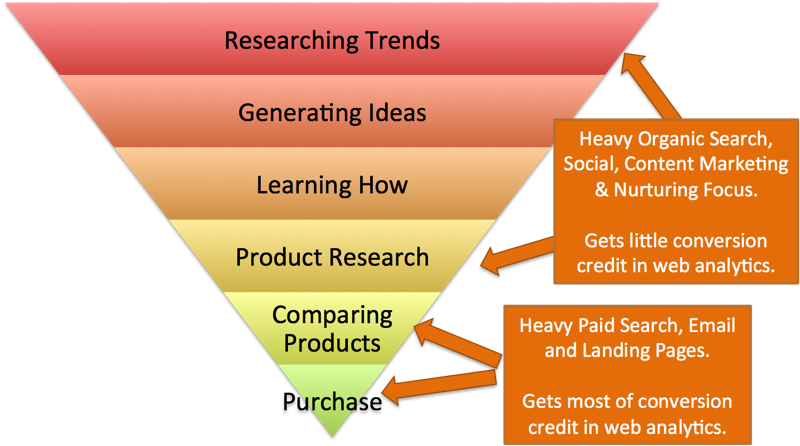 As content marketers, we may find that our efforts do not always contribute directly to these macro goals. That is why we also recommend creating micro goals to track the actions on your website that you consider a success. Example micro goals can be video views, PDF downloads and key page views. Micro goals allow us to track the activities we generate at the top of the marketing funnel. These activities may lead to future revenue opportunities. Setting up micro goals allows you to prove your contributions to the website revenue operation. Proving our value is key to securing future budgets and predicting results in the future. Why do I love to hate it? Because it paints an incomplete picture. It implies that people leaving your site is a bad thing, when that is not always the case. Instead of dwelling on bounce rate, I recommend looking at content from a positive perspective. How many people viewed the page and how much time did they spend on it? How many goal conversions were influenced by this action? If you still want to look at bounce rate, this guide from Online Metrics shows you how to get adjusted bounce rate in Google Tag Manager. Grouping your content together in Google Analytics helps you measure performance by category. This is especially useful for large websites that cover many topics. 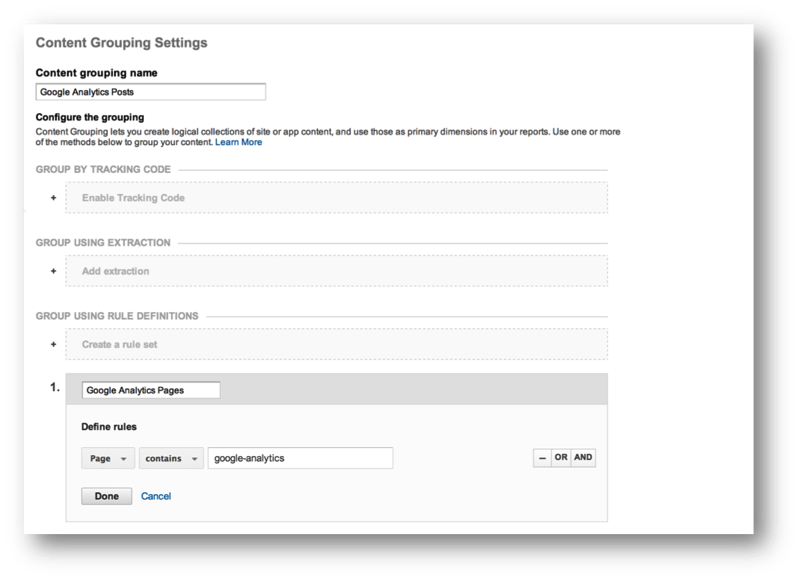 You can set this up in Google Analytics by rules, URL extraction or tagging your website. And the results allow you to see which topics that you cover perform the best. Instead of relying on our instinct and intuition, we can use numbers to see which content resonates with our audience. Skip the guesswork and focus on what is working! 7) What is the Big Draw? Do the majority of visitors to your website come from a handful of pages or do you have a wide distribution of pageviews? Is your homepage as important as it seems, or do people find your content directly through search results? 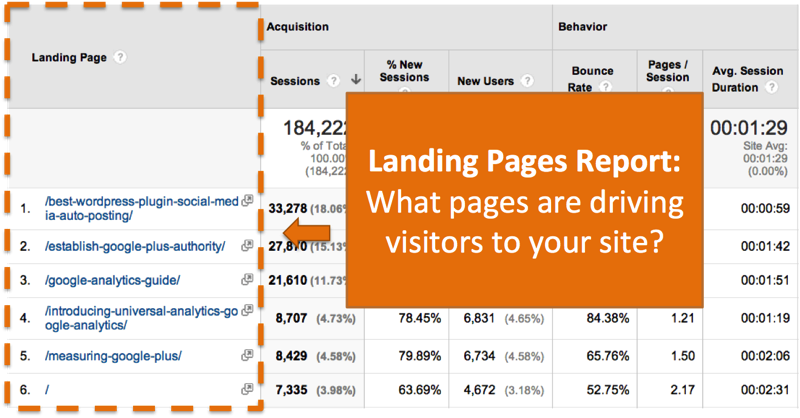 The landing pages report in Google Analytics will help you determine these answers. Not only that, but it will give you insights about where you should focus your optimization efforts. Say that a piece of content is drawing in tons of visitors who leave after one minute. What would happen if you made changes to engage them further in your site? What changes should you make? Use the landing pages report to understand what content currently resonates with your visitors. Then visit those pages on your website and come up with ideas for how you can make that page better. There are always opportunities for improving our websites. Always. The pages on your website that get the most visitors have the most improvement opportunity. Because they already resonate with visitors. A small improvement for a lot of people can generate more impact than a big improvement on a page nobody visits. Analytics helps us find where we have opportunities. Content marketers are the geniuses who can come up with a creative way to act on those opportunities. Content marketers can spend days, weeks or months creating pieces of content for the web. When the content finally publishes, our instinct is to celebrate the launch and move on to the next project. I have found that the way you promote your content is much more important to success than the content itself. There is a lot of great content on the web. This is especially true in a post-panguin world. You can produce remarkable content and have it go unnoticed. I know because this has happened to me. That is why I started to adopt some rules with content promotion. I need to spend time promoting content until enough visitors have arrived to make these efforts worthwhile. Securing a content marketing budget is difficult in many industries. From my experience, this difficulty comes from a lack of understanding of the purpose of content marketing. Your company may try to compare the ROI of content marketing efforts to direct response channels like paid search or email. Content marketing may not drive any revenue at all for a business. But maybe revenue generation is the wrong indicator of success. Content marketing and organic search are top of funnel activities for marketing. Judging them against bottom of funnel activities that generate sales (like PPC) is not a fair comparison. This is why micro goals are so important for measuring success of content marketing. You shouldn’t expect that every piece of content will generate an immediate sale. This is especially true with selling big-ticket items. But every piece of content should lead your target customer on a journey to the next steps. Good news: Google released a tremendous tool that allows us to measure the sales impact our efforts! This tool is called Attribution modeling, and is available to any GA account with goals or e-commerce tracking set up. I use this report to help get at the true value that is created from content marketing efforts, and often I see some promising results. Check out the example below. We see that Organic Search and referral traffic is being under-reported by a last click attribution model. Since last click attribution is the standard for the web, this is a problem. While it may not seem like a large amount of money, it can help you win the argument for more resources moving forward. The best part? The content you already created will continue to draw in top of funnel visitors well into the future. So every investment you make in content compounds on itself. Another aspect of securing budget for content marketing is to prove the return on your investment. If you can prove the revenues you draw in from your marketing efforts, securing budget should not be an issue. You can use Google Analytics to pull in revenue numbers from content marketing. Use the multi channel funnels tool or attribution modeling to find this information. Don’t be scared of analytics! It can be your best friend, help you win arguments, and make you look like a genius. You can use analytics to tell stories and secure budgets. You can use analytics to focus on the best opportunities. It has never been easier to collect data on your website. Google Analytics makes it really easy to turn that data into insights and knowledge. You can use that knowledge to make informed decisions. I hope this post inspired you to get beyond your analytics comfort zone. Time for you to get more out of your analytics!